A great book about an even greater book is a rare event in publishing. Robert Darnton’s history of the Encyclopédie is such an occasion. The author explores some fascinating territory in the French genre of histoire du livre, and at the same time he tracks the diffusion of Enlightenment ideas. He is concerned with the form of the thought of the great philosophes as it materialized into books and with the way books were made and distributed in the business of publishing. This is cultural history on a broad scale, a history of the process of civilization. In tracing the publishing story of Diderot’s Encyclopédie, Darnton uses new sources—the papers of eighteenth-century publishers—that allow him to respond firmly to a set of problems long vexing historians. He shows how the material basis of literature and the technology of its production affected the substance and diffusion of ideas. He fully explores the workings of the literary market place, including the roles of publishers, book dealers, traveling salesmen, and other intermediaries in cultural communication. How publishing functioned as a business, and how it fit into the political as well as the economic systems of prerevolutionary Europe are set forth. The making of books touched on this vast range of activities because books were products of artisanal labor, objects of economic exchange, vehicles of ideas, and elements in political and religious conflict. 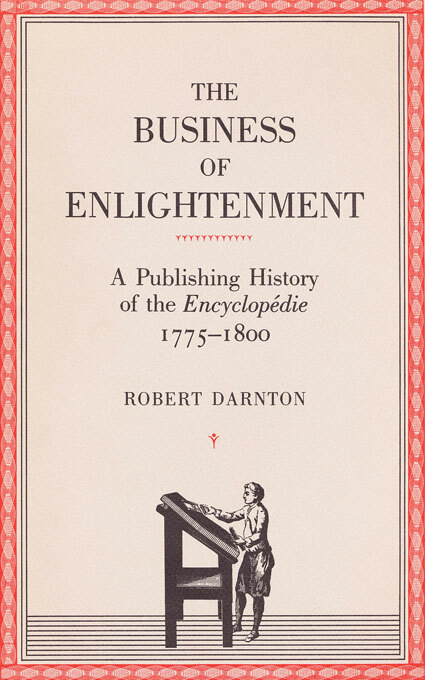 The ways ideas traveled in early modern Europe, the level of penetration of Enlightenment ideas in the society of the Old Regime, and the connections between the Enlightenment and the French Revolution are brilliantly treated by Darnton. In doing so he unearths a double paradox. It was the upper orders in society rather than the industrial bourgeoisie or the lower classes that first shook off archaic beliefs and took up Enlightenment ideas. And the state, which initially had suppressed those ideas, ultimately came to favor them. Yet at this high point in the diffusion and legitimation of the Enlightenment, the French Revolution erupted, destroying the social and political order in which the Enlightenment had flourished. Never again will the contours of the Enlightenment be drawn without reference to this work. Darnton has written an indispensable book for historians of modern Europe.